From Sussex we scoot over to Kent, and the small but perfectly formed Nine Bob Notes! 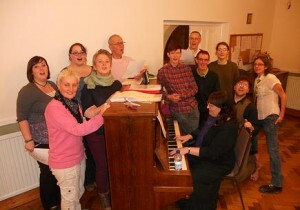 The Nine Bob Notes are a new lesbian, gay, bisexual, trans and intersex choir and had their first performances in 2012. All LGBTI people living, working, studying or socialising in Kent are welcome. They meet fortnightly on Tuesday evenings in Canterbury, and are performing right up-to-the-minute repertoire including Adele, Lady Gaga, among some more traditional pieces.